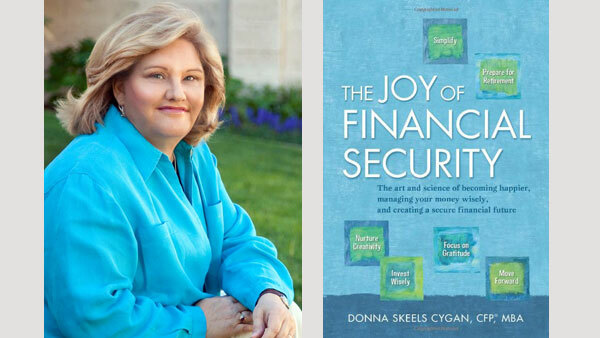 Donna Skeels Cygan teaches clients to invest in joy, not just stocks; gives away her referrals; and wants advisors to spread happiness to their clients. Donna Skeels Cygan is a most unusual financial advisor. She teaches clients how to invest in…joy, in addition to stocks and bonds. She gets lots of lucrative referrals from attorneys and CPAs, and turns them all down. And whereas advisors who write a book typically intend to use it to boost their status vis-à-vis well-heeled clients and prospects, Cygan’s target audience are the masses of Americans struggling to pay their credit card bills, not those seeking or sought by Merrill Lynch. The book, titled “The Joy of Financial Security,” came out last year before Thanksgiving, and the timing is probably not a coincidence since she views giving thanks—on a daily, not annual basis—as a key component of happiness. “I do focus on investments and I do do them well, but I don’t want that to be all there is,” the Albuquerque-based fee-only advisor says in a phone interview with ThinkAdvisor. So after updating her clients’ net worth statements and addressing tax planning and retirement projections and the like, the principal of Sage Future Financial ends her meetings with a discussion of goals. A few years ago, she gave her clients an article about starting a “gratitude practice.” Then years later, talking to one client couple, she learned that they had adopted the practice of sharing with each other daily before retiring at night something they were grateful for. “It had been hugely beneficial for their marriage,” she relates. In short, Cygan, like other financial advisors, wants her clients to become rich; it’s just that she employs a broader definition of true wealth. “If we can take the focus away from materialistic things, and put it back on family and friends and things that make our lives really rich” is how she formulates her mission statement. Cygan knows about this source of wealth because she came near to squandering it in her first financial planning practice, which she started in 1998 and then sold in 2007 (after which she spent a year working for the buyer). After honoring her non-compete agreement, she came back to the business in 2010, but this time with firm commitments not to neglect her family. “If I wanted to grow the firm, it would be so easy. I get so many referrals,” says Cygan, who says the “investing in joy” angle is a big draw for clients and their friends. “The Joy of Financial Security” is “not just a personal finance book,” Cygan emphasizes. That is because the former psychology undergrad and MBA recognized an unseverable link between money and happiness she felt was not widely understood among the majority of Americans who are addled by our consumerist society. “When I opened my first financial planning practice, I noticed right away that clients with a healthy attitude toward money were happy overall,” so she spent six years examining the research to identify barriers to financial success and happiness in the general population whose finances usually go unmentored by a financial advisor. “My clients are the millionaire next door; incredibly responsible…My clients, and other advisors’ clients, are not typical of mainstream America,” whose condition she says has been worsening in recent years. The problem lies beyond the average household’s declining real income, which has fallen from $56,080 in 1999 to $51,017 in 2012 on an inflation-adjusted basis, according to U.S. census bureau data. “In our budgets, we have all these new items: technology; cable TV packages; cell phone bills—these add up to thousands of dollars. Health care premiums have gone up 80% in the last 10 years, and employees are paying 89% more for health care,” [since their companies are paying for a small portion, she clarifies]. So with declining incomes, how are Americans paying for these rising expenses? Cygan contrasts societal pressure to spend in the U.S. with Denmark, which has ranked No. 1 for a number of years consecutively in an annual World Happiness Report. With the holiday season close at hand, Cygan warns that consumerist pressure they feel now will result in credit card debt Americans will have trouble paying down come January. Apart from the focus on gratitude she counsels her clients, another strategy for getting off the consumerist train “is to nurture your creativity—writing book challenged me creatively; taking really good care of yourself healthwise; exploring nature; having a sense of purpose” are other strategies she discusses in her book. Her next creative project is to write an e-book specifically for financial advisors, which she says will be free of charge and available for download on her website under a soon to be added financial advisors tab before December 31. “It’s going to keep it super-simple for a financial advisor to use the [psychological] strategies… with their clients. Cygan hopes advisors will use the strategies with their clients starting in the new year. “It takes the focus away from money. We don’t want to focus only on that; it can truly make their lives rich, much more so than the money,” she says.